In early June we had a couple of days in New York and just could not pass up an opportunity to DINE at Le Bernardin. This is such a treat, especially if you enjoy fish served perfectly course after course. We stayed at The Plaza and enjoyed having lunch downstairs in the Plaza Food Hall, by Todd English. This is a new project for the hotel and we both argee it is good for lunch and that dish of soft yogurt around 4pm. The food halls are not open until 10am so we walk up the street to Le Pain Quotidien for breakfast. Le Pain Quotidien is located on 7th and 58th, they bake great breads and can make a perfect soft boiled egg. The other experience that we had not done before was take the train to the Bronx and visit the Botanical Gardens. They are featuring their version of Monet’s Gardens and they have done a great job, running through the fall. Prague has been on our bucket list for several years so this quick 5 days was filled with exploring and wonder. a chance to catch up. After lunch we took a good 2 hour walk and then back to the hotel for a nap and unpacking, we had dinner reservations at 8pm. Dinner was at ” V Zatisi” , an upscale restaurant offering multi course tasting menu. The restaurant is walking distance from the hotel and well worth the evening, we had the duck and gave it an A.
thousand years. The city was the capital of Bohemia and escaped the ravages of war relatively unscathed. It is hard to pass up sitting in one of the many squares for lunch and just watching the parade tourists. We shared a wonderful pizza at “La Scala” and planned our route back to the hotel. The hotel has a beautiful patio for late afternoon wine and snacks. That afternoon nap always makes a vacation more enjoyable. Dinner was planned for 8:30 pm. ll the tourists enjoying the evening. We had reserved a terrace table looking out on the river, shared beautiful duck fois gras and white asparagus salad , local wine and a toast to Prague. hat happened in our life time. We headed back to the hotel for lunch in the 4 Seasons Italian restaurant,”Cotto Crudo”, it had starting to rain. Good time to read up on the city. Our friends were staying a another great hotel down the street, Palace Praha, so we decided to have dinner together at the amazing Alcron, in the Radisson Hotel. This small, 8 tables, 1 star restaurant is worth a visit. www.alcron.cz. We had a multi course tasting menu and each course was more exciting than the last. This restaurant is a must when you visit Prague. t 2 hours away, This was a silver mining town and has a very famous Cistercian monastery from the 12th century. One of the obligations of the parish was to bury the dead and the cemetery existed here from about the middle of the 13th century. Thousands of people found their resting place here at the time of epidemics. They say that about 30,000 bodies were buried here at the time of the plague in 1318. Bones from abolished graves first were piled up around the chapel and later, in about 1500 a half-blind monk piled them into pyramids. The beginning of the 18th century the Convent Church was rebuilt and the bones were used to decorate the interior. The bones were cleaned and it is estimated that the remains of 40,000 poeple were used to decorate the Sedlec Ossuary when it was rebuilt. Worth the visit! 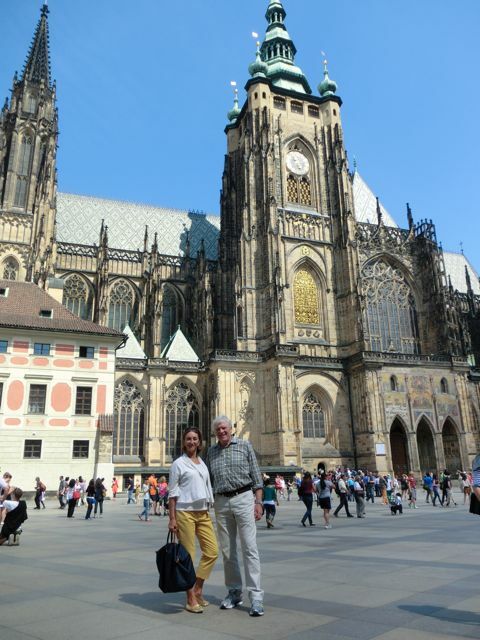 We shared a local lunch of Goulash at Dicicky and headed back to Prague. The drive across the beautiful fields of poppies and wild mustard was peaceful finish to the day. We had dinner at a place called Sasazu, there was a lot of talk about this huge Asian inspired restaurant but it was like dining in a Disco. The food was fine,but since we live on the West coast we have great Asian food and this did not match up. We should have gone to La Degustation instead, our friends gave it a very high rating, just incase you need another suggestion. We enjoyed our short 41/2 days and were happy for the experience.